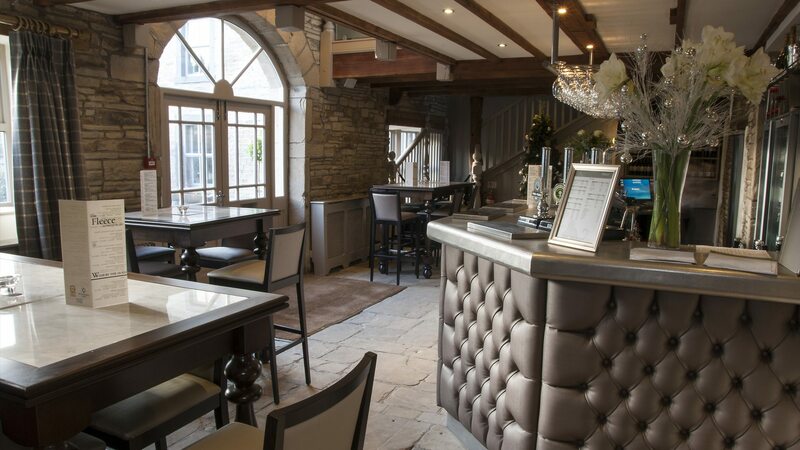 From late 2012 to early 2013, Dawnvale was enlisted to refurbish The Fleece Countryside Inn in Halifax, designing, creating and installing a new kitchen, bar and restaurant, and a brand new outdoor eating area with views over the Ryburn Valley. The Fleece Countryside Inn was one of three Boothwood venues that Dawnvale was invited to refurbish; we also worked on the Milestone bar and restaurant, and Catch seafood eaterie. Dawnvale was brought on to transform The Fleece Inn from a run-down old pub to a modern venue, creating a modern rustic look, in-keeping with the venue’s rural location. Once we had completely gutted the building, we installed a beautiful York stone floor. The ceiling beams and original stone walls were exposed and carefully restored for an authentic feel. We installed a new island bar with cocktail stations, upper glass racks, refrigerated wine displays and a distressed steel bar top, finished with a classic deep-buttoned, upholstered bar frontage. We created a new function suite, and crafted bespoke furniture for the restaurant - contemporary tables with oak stained frames with turned legs and marble tops with inset ice wells. We transformed the outside terrace with seating and a mobile BBQ station.